Mrs. Nancy (Ruggiero) Colardo, 91, of Barrington, died peacefully on Monday, May 21 surrounded by family at St. Elizabeth’s Manor, Bristol. 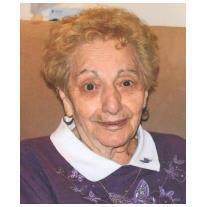 She was the wife of the late Vincenzo “Jimmy” Colardo for 68 years. Born in Bristol, she was the daughter of the late Michael and Maria Antonia (Romaniello) Ruggiero. She was a graduate of Colt Memorial High School, Class of 1945. Nancy was employed by the Barrington Public School System for many years prior to her retirement. Mrs. Colardo was a communicant of Holy Angels Church. Nancy enjoyed the beach, reading, sing alongs with friends, doing word puzzles, and knitting and crocheting. She donated many of her crocheted baby hats to the Women and Infants nursery. She cherished her family and loved spending time with them. Nancy took pleasure in preparing Sunday dinners of macaroni with her famous homemade meatballs and sauce for her children and grandchildren. She is survived by two daughters, Jeanette Vermilyea (Willis) of Coxsackie, NY and Angela Hawkins (Edward) of Warren, RI, four grandchildren Jeffrey (Kate) Vermilyea, David (Heidi) Vermilyea, Jamie Hawkins, and Christina (Matthew) McCartin, six great-grandchildren Ryan, Megan, Landon, and Austin Vermilyea, Mackenzie and Kinley McCartin, and three sisters Anna Carre, Jennie DiPippo, Leonora Delmage, and many nieces and nephews. She was the sister of the late Lena Proto and Martha Andrade. Mrs. Colardo’s funeral will be held on Friday, May 25, from the Sansone Funeral Home, 192 Wood Street, Bristol, at 8:30 a.m. with a Mass of Christian Burial in Holy Angels Church, 341 Maple Avenue, Barrington at 10:00 a.m. Burial will follow in Santa Maria del Campo Cemetery Upland Way. Visiting hours are Thursday, May 24, from 4-7 p.m. Flowers are respectfully omitted. Contributions in Nancy’s memory to Holy Angels Church, 341 Maple Ave, Barrington, RI 02806, St. Elizabeth’s Manor, Special Care Unit, 1 Dawn Hill Rd, Bristol, RI 02809, or Hope Hospice and Palliative Care of RI, 1085 No. Main St., Providence, RI 02904 would be deeply appreciated.